Amazon's Good Girls Revolt : These Girls Want To Write? Good Lord! What Will They Want Next? In contrast to Vietnam War or Civil Rights protestors, the 1960s fighters in the women's movement first had to convince some people there even was a problem. The clueless crowd in the new Amazon Prime series Good Girls Revolt, which drops Friday, includes the editors of a national news magazine. In the final moments of the '60s, December 1969, they can't imagine why the women on their staff are suddenly no longer content being anonymous researchers. These women want a chance to write bylined stories. 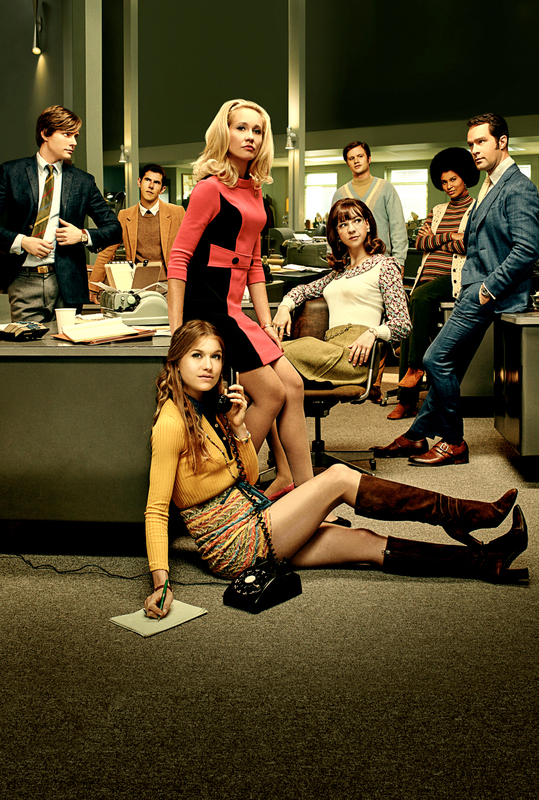 Based on a real-life legal action brought against Newsweek magazine and chronicled in Lynn Povich's book The Good Girls Revolt, the Amazon Prime series focuses on three women who do decide they want the same shot as the guys. These include career woman Jane Hollander (Anna Camp), free-spirited Patti Robinson (Genevieve Angelson), and the initially mousy Cindy Reston (Erin Drake) (above). They are all enthusiastic contributors to the magazine, which for purposes of this show has become News of the Week, even though they realize the job has a low glass ceiling. Under magazine policy, women can never become writers. But hey, the men who run the place figure, they aren't really serious about writing anyway. They just want some little job to earn pin money until they quit and start their real life's work, which is raising the kids and tending to their successful hubbies. The women at News of the Week start feeling a little more ambitious when Nora Ephron (Grace Gummer, above, in a brief but memorable appearance) quits rather than stay in a system where she can never achieve her writing dream. Eventually they get a lawyer, Eleanor Norton Holmes (Joy Bryant) (above), and their contentious, precedent-setting ride gets underway. The men's side includes editors William "Wick" McFadden (Jim Belushi), an old-school World War II veteran, and Finn Woodhouse (Chris Diamantopoulos), a younger and slightly more flexible fellow who argues that the magazine needs to pay more attention to contemporary culture. In contrast to the adversaries in civil rights stories, who often are snarling racist bullies, the men here are not portrayed as monomaniacal oppressors. "I never saw the men here as evil," says Dana Calvo, who created the series and is one of its executive producers. "The question is how many men in 1969 would have given women a chance." "Witt believes in his version of America," says executive producer Lynda Obst. "He has great respect for Nora. But if she becomes a writer for him, the system changes and everything could fall down." "Finn is operating in a system where women aren't allowed to be writers," says executive producer Darlene Hunt. "That's just the way it is. It's not something he thinks about. His focus is to beat Time magazine." The real and larger problem, says Hunt, was the widespread attitude in journalism, and elsewhere, that women were served adequately by what was thought to be benign paternalism. To men like McFadden, that was enough, and it had never occurred to him that perhaps anyone could see it differently. "There's a scene," says Hunt, "where the male boss looks at one of the women and says, 'You're such a nice girl.' He's just mystified. "One of the challenges when we were writing the script was asking ourselves, 'Is he too much of a bad guy? What does he really want?' "
Another challenge, says Calvo, was acknowledging that the women's movement was running parallel to and often intersected with the anti-war movement, the civil rights movement, the gay rights movement and other social forces of the late 1960s. "We mention the others," Calvo says. "We couldn't ignore them. But we try to keep our focus on what our girls are doing." Making the scope too broad, says Hunt, "would be too easy. Our question was, 'What's our show?' You can find you're writing a whole episode just on journalism." The producers of Good Girls Revolt acknowledge that what Patti, Jane and Cindy want seems, today, like just common sense. If a woman is the best writer for a story, she writes the story. Everyone wins. But with the likes of the Rolling Stones and Iron Butterfly to remind viewers when this is all taking place, their seemingly benign request has seismic implications. It's a good reminder that America has seen major changes in a relatively short period of time - and that in gender equality as in other areas, a few more are still in order.